Place the first six ingredients into a blender. Blend together to a smooth consistency, scrapping down the sides as needed. 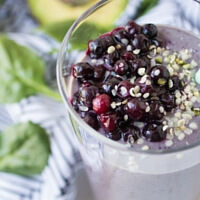 Add the apple, cucumber, 1 cup of frozen Wild Blueberries and ice to the blender. 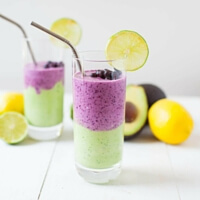 Blend again to a smoothie like consistency. 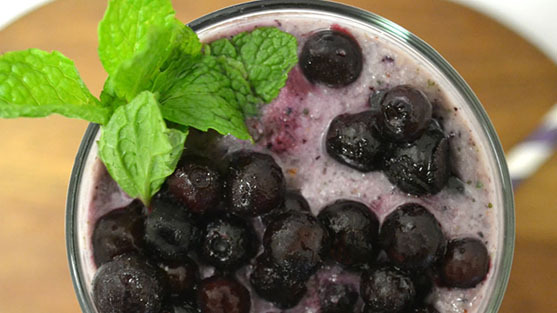 Fill two serving glasses with the remaining ¼ cup of Wild Blueberries followed by the smoothie. Garnish if desired and enjoy immediately with a smoothie straw.